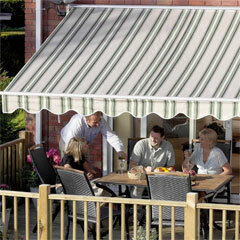 Pergola awnings have become much more popular in the last few years as more of us are loving eating al fresco! There's nothing quite like good food and great company to help us unwind. 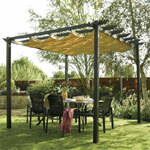 What about having a pergola to act as a fabulous focal point, drawing everyone under its spell. A canopy provides welcome shade from the sun as well as protection against more inclement weather. Not only that, it will look great too! All pergola canopies are fully retractable if you prefer to let the sun shine down through the rafters. Alternatively, remain undisturbed from passing weather under the showerproof fabric of the canopy. Both awning and shade sail have UV filters and are showerproof too. If you like to use your pergola for outdoor dining, it's a good idea to have pergola canopies fairly near to the house for obvious reasons, even having them attached as a lean-to pergola kit. If you like to eat in the evening sun, it might be better to have the pergola away from the house where it can catch the late evening rays. There are some good pergola kits, awnings and shade sails to choose from. It's just a matter of choosing which style will suit your garden best. Take into account how you are going to use it and what sort of look you would like: traditional or modern. The aluminium pergola kits look more modern than the wooden ones, for example. 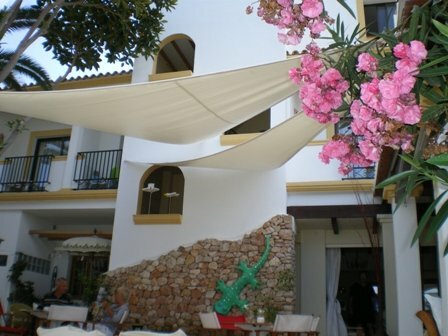 The shade sails can create a wonderful effect, especially when they are used together at different levels. Here is a picture of them used on a mediterranean courtyard. Just lovely! 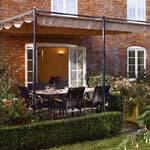 These fabulous pergola kits don't have to be used for dining alone. Add sunloungers, throws, cushions and even a hot tub to create a wonderful place to relax. It's often the accessories that make all the difference!